Do You Use a Mac? Safeguard It Against “MacDefender” Malware by Understanding the Scam and Getting the Fix! Apple announced last night that it would be sending an update to its OS X operating system that would protect users from and remove a program called “MacDefender” (alias “MacProtector” or “MacSecurity”) that had been finding its way onto some consumer’s machines. The program is a piece of malicious software (or “Malware“), that is ultimately designed to get you to send your credit card number to a company to sell you a program to “fix” the problem. You are browsing Google Images and when you click on an image, you are redirected to a fake “security alert” webpage. The security alert webpage informs you that you have been infected with a virus, and recommends you download a free program – MacDefender – to solve the issue. MacDefender pops up on your computer as an offering. If you click OK, you’ve just invited the malware onto your system. Here’s where it gets malicious. The installed malware begins to make your system appear as if it has become infected with a virus. The program regularly opens up new browser windows to pornographic websites. Needless to say, this is very embarrassing, as well as making computer very hard to use. At this point you are probably thinking “well, I just installed a new anti-virus program”, and you try to run the MacDefender program. Now it gets really nasty. I stepped inside an Apple Store last weekend for the very first time, and had an amazing customer service experience. For one thing, the doors were wide open. There may have been detectors at the front door to make sure I didn’t try to steal anything, but I didn’t see them if they were there. Walking inside I was immediately greeted by an Apple employee. Not an employee standing at a podium or sitting at a desk, but one wearing an orange shirt and a headset who greeted me and asked how she could help me. 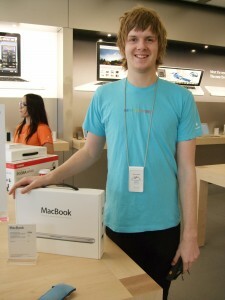 I explained that I was thinking about a new laptop but didn’t know a lot about Macs. 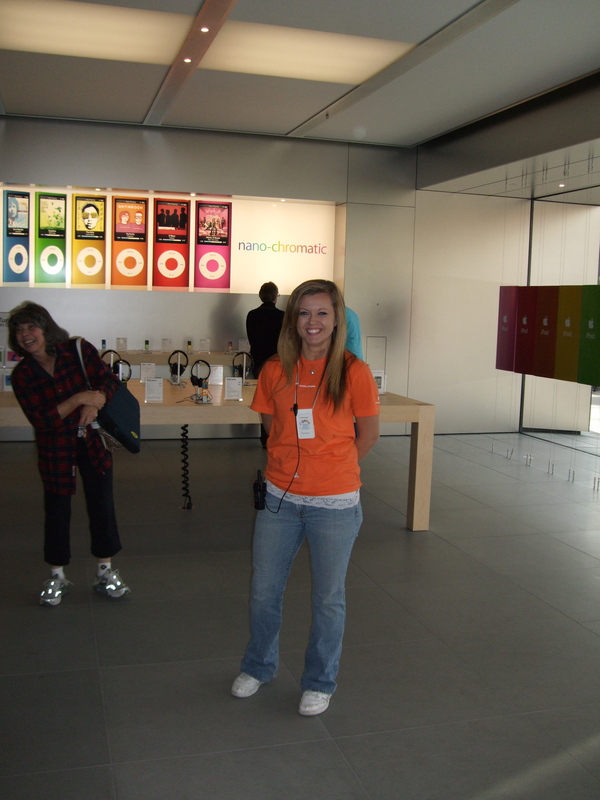 She told me she was the concierge and her job is to match customer needs with Apple store staffers and service. On the very busy saturday that I was there I saw three concierges (conciergi?) Our concierge told us that she would send the next available specialist to us and she asked for our first names. She invited us (Doubting Thomas husband accompanied me) to look at the computers while we were waiting. At other stores I’ve visited for the purpose of buying electronics, there is one, or sometimes two of each model. You may have to wait a bit to see the model you are interested in if the store is busy and it is not unusual to go through an extensive decision making process only to find the model you want is not in stock. At the Apple store I rounded a large rectangular table twice before it dawned on me that I was looking at six of the same model of computer, and that the next large table had six of another model. One thing that struck me quite forcefully about the Apple store was that it was so different from I had EXPECTED and had formerly ACCEPTED. We expect and accept wasted time, poor service, poor attitude (the last time I was at a big store I asked the salesperson if he was having a tough day he looked so miserable) and out-of-stock items. I made my decision after about 20 minutes of discussion and David left us to get my new computer. He returned with my computer and a handheld credit card swiper and asked if I would like a paper receipt or an emailed receipt. All this took place at the demo table about three feet from the concierge and about six feet from the front door of the store. Greeted immediately by the concierge who was friendly and helpful. She took our names, told us what would happen next, and gave us a great sense of being properly in line for service. There were lots of the same computer model to try out and play with – no waiting for a turn to touch the product. All the computers were plugged in and worked. A salesperson who seemed to know all the answers waited on us, and brought things to me without me having to make my way to the back of the store to check-out. What lessons will I take from this for the practice I manage? First of all, I’m thinking about adding a concierge (should I think of a different name? maybe I’ll have a contest!) to greet patients. This could potentially solve several problems that I have. One is the logjam and lack of privacy at the front desk. The concierge could greet patients very personally, and could get them established with paperwork, insurance cards, etc., as well as answering questions and making sure patients have what they need while they’re waiting. Taking ideas from other companies and fields is one of my very favorite things in the whole world. 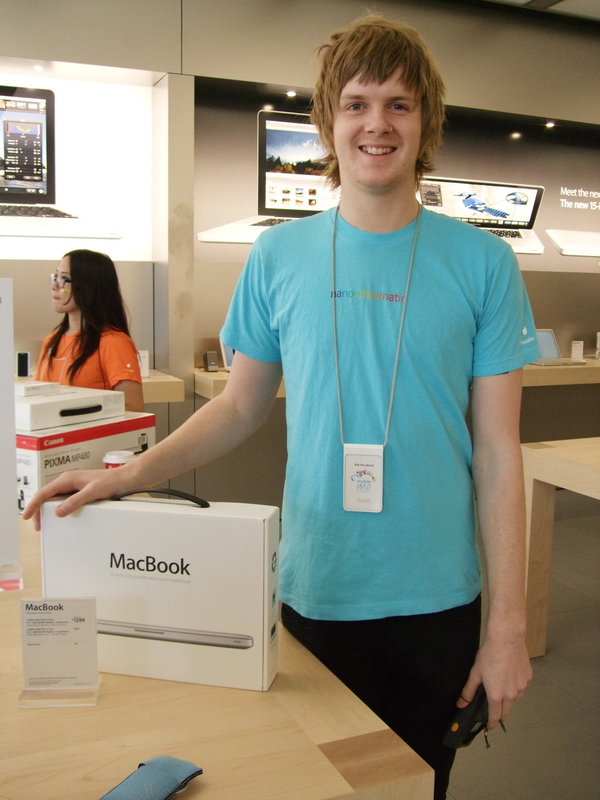 I have more ideas about changing things in the practice since my visit at Apple, but I’ll save that for another post.